Hello dear friends: Well, all of us over at THE FLOWER CHALLENGE are thrilled and grateful for the amazing response we are getting from all of you who joined us in the gallery of this, our very first challenge blog post. 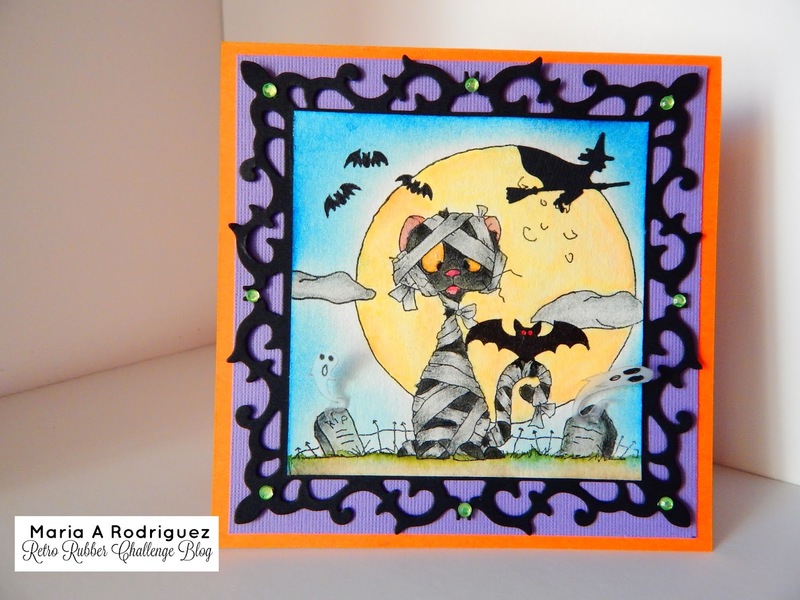 We hope you continue to enjoy this blog and come to visit often and participate in subsequent challenges, we simply love all the amazing cards you have submitted, keep them coming. 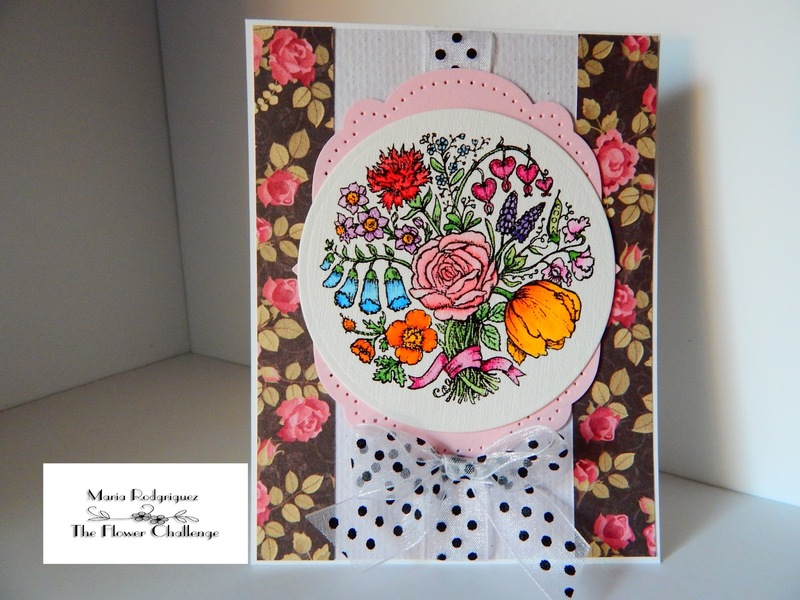 Here is a card I made for the mid month reminder, so I hope you like it, get inspired and come to the challenge and join us in the gallery. 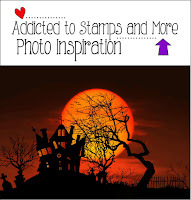 To get more inspiration, visit my teammates blogs to see their beautiful creations and leave them some sweet inky love. This image is from the Power Poppy by Marcella Hawley called Spring Time Love and, even if we are in the middle of October, beautiful flowers are really for any time of the year. 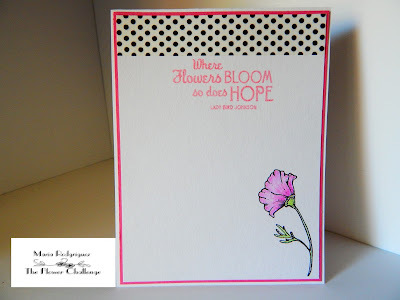 I stamped this image onto a die cut circle of Canva water color paper with Versafine black ink and heat embossed it with clear embossing powder. I like how the raised borders of the embossed images keep your water colors from bleeding out. I colored it with SU markers and an aqua painter. The pattern paper is from a discontinued line from Lili of the Valley, I was lucky enough to grab a bunch of 8x8" pads and packages before they were gone. 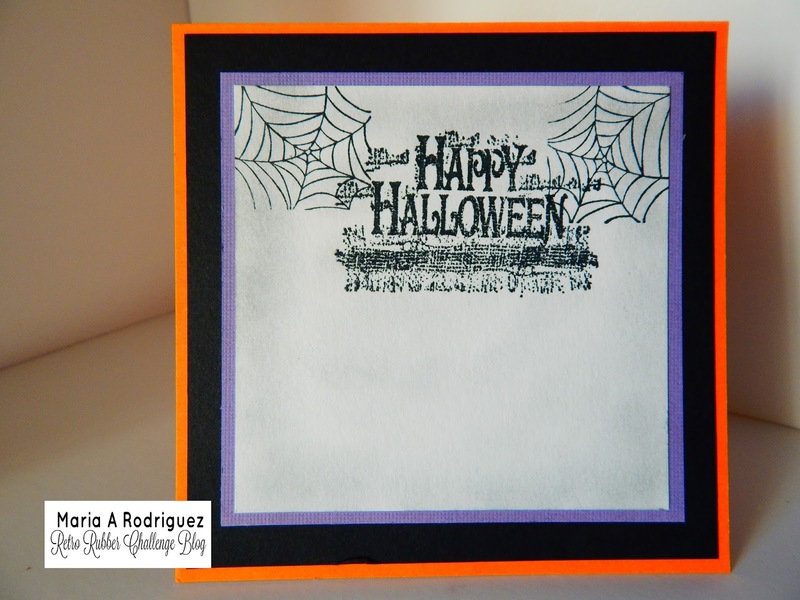 I die cut a piece of pink card stock with the retired SU Labels die set and paper pierced it. The ribbon is from my stash. I was lucky I had this roll of washi tape that looked like the ribbon in the front, this organza ribbon is kind of hard to stick to paper. 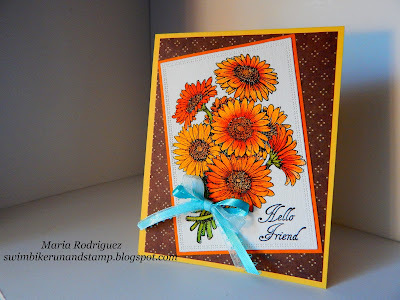 The sentiment is from a retired Flourishes set called "Tulips for Friends" and the little flower on the corner from the Power Poppy by Marcella Hawley set called Country Side Bouquet Delux, colored it with Prismacolor pencils. Thank you so much for stopping by, I appreciate your visit and your comments more than words can express. Until next time, happy stamping. Hello dear friends: I've been busy this past couple of days doing some Fall gardening, cutting dead branches, mowing the grass and, believe it or not, racking leaves!! Autumn is here and I love it, the only thing I do not like to much is the racking of the gazillion of leaves that are starting to fall but, all things considered, this is a minor detail in exchange for the gorgeous colors around my house. Anywho, I have a card today using a little stamp I've used before for THIS CARD I made for my grandson who is a Chicago Bears fan. I've been a Dallas Cowboys fan since age 15!!! I'm 65 now so, do the math, LOL!! This time there is no football theme, just this fun image for you to enjoy. I will link this card to a few challenges at the end of this post. 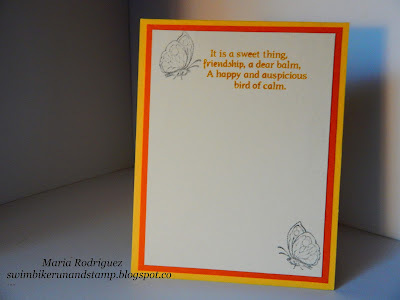 I don't know for sure where I got this pumpkins stamp, it's so old and, back then, when I started making cards I never bother to write down or save the package they came in so, I apologize for not having this information, I've been looking for it, but so far, no luck. So I stamped this image onto a piece of Canva water color paper with Versafine black ink and heat embossed with clear embossing powder, I cut the image with a rectangular die and did the outside the box technique to make sure the bottom of both pumpkins were not cut out by the die. I colored them with SU markers and an aqua painter, super easy. 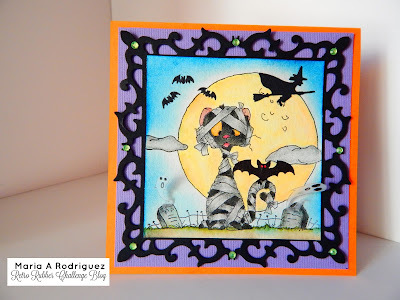 The pattern paper is from my stash, the bats are die cut and the sentiment is from a SU set called BITE ME! 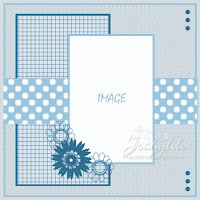 Super fabulous images and it's on sale now, woo hoo!! Here I mixed some old stamps, the spider web, from Stampabilities and the sentiment, from an old Flourishes set called "Witching you a Happy Halloween", with a new one, the big spider coming down from the web, from the SU set "Bite Me!" 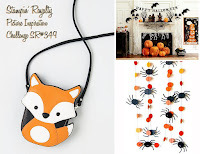 The Male Room challenge #46, Halloween. Double D Challenge "Pumpkin Time"
Creative Moments Challenge #104 "Show us your Pumpkins"
Thank you for stopping by, I appreciate your comments more than words can express. Hello everyone: I hope Autumn is showing up with it's gorgeous colors in your little corner of the world, up here in NW Indiana, some of the trees around my house, are starting to change into lovely shades of gold and orange, it wont be long till all of them look amazing. 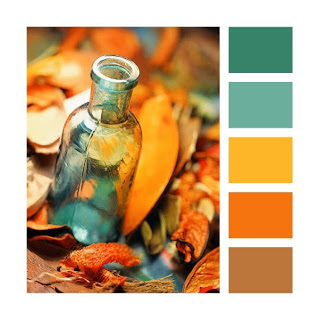 This week over at SHOPPING OUR STASH, we want you to get inspired by this colors to create your cards and join us in the gallery. I'll include our color chart to guide you and inspire you. 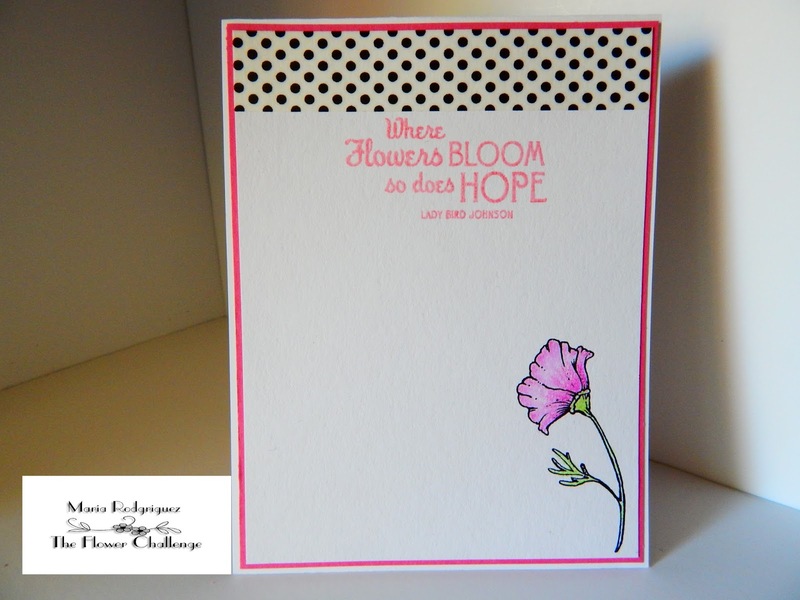 Here is the card I made and, for more inspiration, just hop over my teammates' blogs to see their beautiful creations. This image is from a very old and retired Flourishes set called Gerber Daisies. 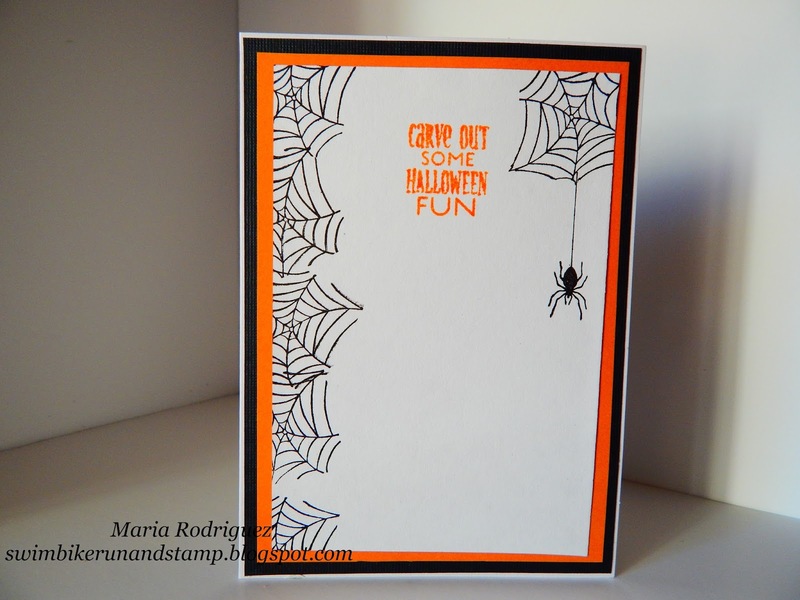 I stamped it onto a panel of Canva water color paper that had been die cut with the Cross Stitched die set from GINA MARIE DESIGNS with Versafine black ink and heat embossed it with clear embossing powder. I then colored it with SU markers and the aqua painter. The pattern paper is from a discontinued line from Lili of the Valley and the ribbon from my stash. I'm making a very definite effort to use my ribbon stash, I've been resisting the temptation to buy more, I need to make a dent on the rolls I have. Both the sentiment and butterflies are from this pretty set. 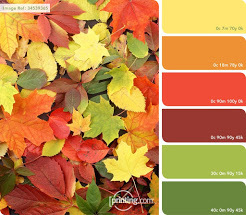 Here is the inspiration colors for this fabulous challenge. We hope you play along, we can't wait to see what you create. 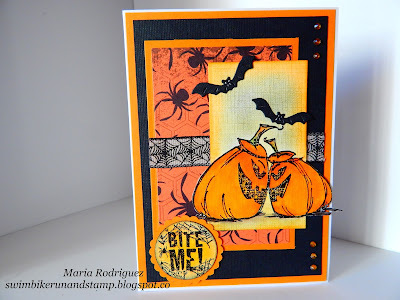 Happy Little Stampers October Challenge "Anything goes with dies"
Art*Journal*Journey Indian Summer/Golden October/Autumn challenge. 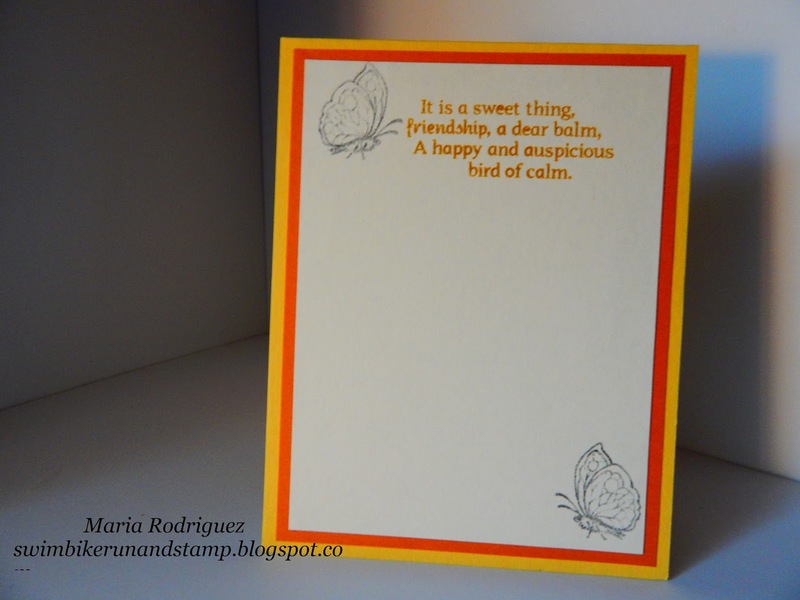 Addicted to Stamps and More Challenge #133 Embossing Wet or Dry.